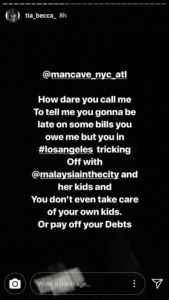 Tiarra Of “Love & Hip Hop Atlanta” EXPOSES “Basketball Wives'” Malaysia Pargo’s NEW MAN, Says He Owes Her Money AND Has An STI!! 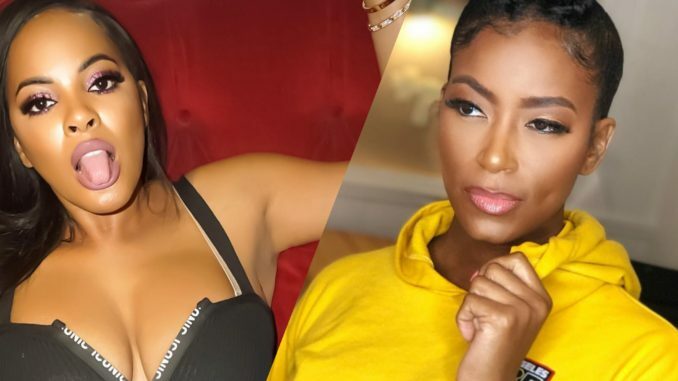 Love & Hip Hop: Atlanta star Tiarra aka Tia Becca exposed her ex who’s now dating Basketball Wives star Malaysia Pargo. 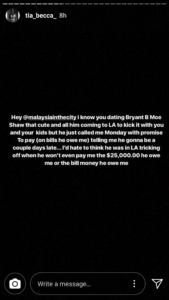 Tiarra called out here ex Bryant Shaw, whom she calls “Bloody Booty Moe” in a series of posts where she tagged Malaysia, saying the man owes her money and has a sexually transmitted infection. Nicki Minaj Brags “I Ain’t Never Have To STRIP” Or “Play A H*e Position” In New Track, Wonder Who She’s Talking About? 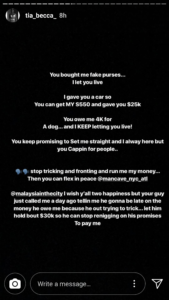 Cardi B & Offset Alleged LEAKED TEXT MESSAGES, Cardi Felt “Violated” By Nicki Minaj, Offset Accuses Cardi Of CHEATING, READ Messages Before The Get DELETED! !